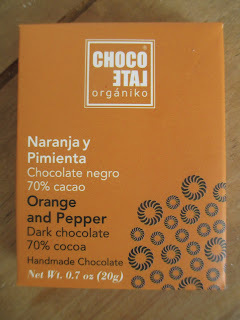 When I put up the trio of Chocolate Organiko posts a little while ago, I apparently left out the fourth bar, the Orange and Pepper. Fitting, I suppose, that it would be such a tiny bar as this that I would have overlooked. Orange isn't normally a flavor I reach for in chocolate. The addition of pepper in here, though, begs curiosity. The aroma is of orange. While I suppose there must be plenty of people who like orange chocolate, I'm not wrong to imagine that most people don't care for it, am I? 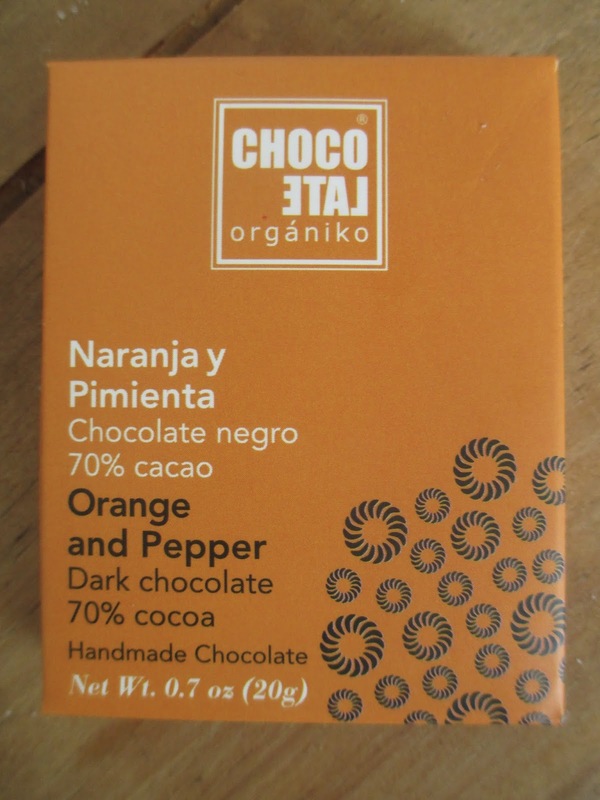 Flavor-wise, orange comes in with a weird, sort of cloying taste when it's inside of chocolate. It just feels odd. The thing is, though, the addition of pepper here was a great idea. The pepper lessens that mellow, cloying orange flavor and enhances the bright and sparkly, fruity flavor. In this way, you get more of the bouncy, peppery feel of bergamot rather than simply orange. There is little else to add about the dark chocolate. It's just the neutral base, a standard 70%, neither sweet nor bitter. Orange still isn't my favorite chocolate flavor combination. Yet if you're going to put the two together, this is the way to go. Rather than wondering who I can give this chocolate away to, I'm finding it pleasant to nibble at. The orange adds sweetness to the chocolate while the pepper adds an extra layer of interest to keep it sparkly and make certain that the flavor is a changing, developing thing rather than simply a stagnant orange in chocolate taste. Just goes to show how trying something a little different (either from what you'd normally get or from what you're used to seeing) can turn out quite well.